In 2010, the most popular attraction in the province of Malaga was the Cueva de Nerja, with 380,100 visitors throughout the year. 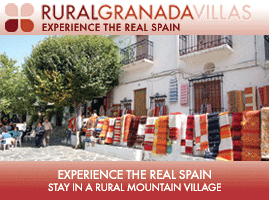 It was followed by the Ronda bullring, with 323,000 visits, and then the Antequera Dolmens with 80,000 and the TorcalNaturalPark in the same town, with 30,000. Malaga’s most popular monument is the Alcazaba-Gibralfaro, with more than 318,000 people visiting the Arab fortress and castle in the first six months of this year. Meanwhile, more than 196,000 people visited the Contemporary Art Centre (CAC) in Malaga, 194,461 visited the RomanTheatre, 189,000 to the PicassoMuseum and 56,000 to Picasso's birthplace, official figures show. Come and enjoy the annual Nerja Festival (La Feria de Nerja), that takes place between 8th and 12th October. As part of the festival you will find music, processions, dancing, fairground rides, food & drink and we think that it is certainly something worth experiencing. We have plenty of properties that are located slightly away from the town centre, allowing you to enjoy the festival but still get a good night's sleep! Enquire now for available villas. 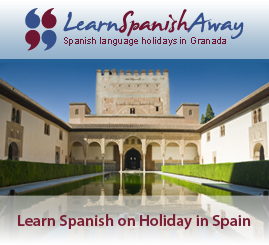 Do you fancy a last-minute break in the sun? Make the most of quieter beaches and cheaper prices before the start of the school holidays by travelling in May or June. And now it is even cheaper to stay as we have 10% off our townhouses in Aljamar and off our rural villas just outside Nerja. Enquire for further details. Framed by majestic mountains and a stunning coast, Nerja, on the eastern Costa del Sol, is a hikers' heaven: a perfect base for walking holidays in Spain. Nerja, in Spain's Andalucia, is an old fishing village set in magnificent scenery 50 km east of Malaga. Are you finding the UK winter cold, grey and damp? Why not head off to Nerja for some winter sun? With average maximum temperatures of 18°C in February and 20°C in March, it certainly sounds inviting. 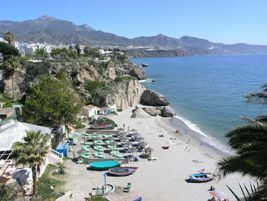 Nerja generally enjoys at least 300 sunny days per year, out of which 200 are virtually cloudless. Come and visit and see for yourself! Leave your hats and scarves behind and enjoy meals outside by the beach & sunny walks through the countryside.